Fermilab's new news system is now online. Employees and users are encouraged to visit the new Fermilab at Work often for the latest stories, announcements and milestones. Please note the new Web address and be sure to change your bookmarks. Tomorrow we will launch a new publication, Fermilab This Week, for employees and users. Newsletter subscribers will receive an email today with more information about the transition. As always, you can follow us on Facebook, Twitter, Google+ and LinkedIn. We hope you like the new system. If you have questions or comments, please email news@fnal.gov. The abstract submission for parallel and poster sessions of the 38th International Conference on High Energy Physics is now open. It will remain open until Sunday, Feb. 7, 2016. Submit your abstracts online. ICHEP 2016 will take place Aug. 3-10, 2016, at the Sheraton Hotel in downtown Chicago. Physicists from around the world will congregate to share the latest advancements in particle physics, astroparticle physics, cosmology, and accelerator science and to discuss plans for major future facilities and industrial opportunities. If you have any questions or comments, email ichep2016@hep.uchicago.edu. The December edition of Fermilab Frontiers, Fermilab's monthly public newsletter, is now available online. View it or subscribe to get the latest about the laboratory's public events, including tours, lectures, arts events and volunteer opportunities. Science fiction has imagined some pretty wild ideas about the universe and our place in it. Parallel or alternative universes have been a recurrent theme in Star Trek. In Interstellar, an astronaut explores hidden extra dimensions. The Matrix and other movies have depicted ordinary life on Earth as nothing but a holographic or mental projection. But these imaginings all seem downright tame compared with the mind-bending science now coming out of physics and astronomy. The weirdness begins at the moment of creation. We have long thought of the big bang as the beginning of time, but theorists now have an idea of what might have come before. Could our 3-D universe have sprung from the formation of a black hole in a 4-D cosmos? The math says: maybe. 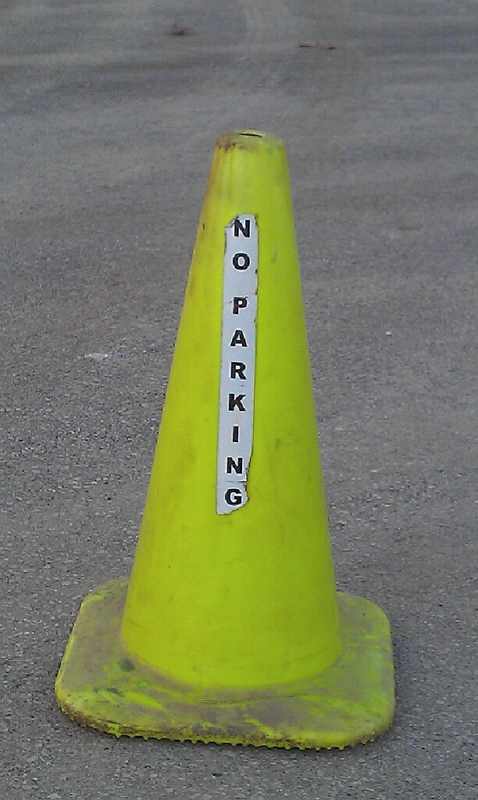 These lime-green cones will mark the special no-parking areas during the winter. Green cones will soon begin popping up in the parking lots — a sure sign that winter is coming to Fermilab. This means that it's time to take more care walking in parking lots and choosing where to park. In addition to parking restrictions, there will also be a few road closures this year. Some roads on site will be closed all winter, starting with the first significant snowfall. With the road closures, crews can maintain the same level of service in critical areas of the site. North Eola Road from Batavia Road to Road C East and Wilson Road from McChesney to B Road will be closed for the winter. In addition, Main Ring Road will be closed to all travel except for emergency and service vehicles. Limited snow removal service in the Main Ring will only provide access for these vehicles. Service levels and access will not change in the F4/AZero and CZero areas. Parking during the winter can also be more complicated. Every winter, FESS Roads and Grounds crews clear more than 85 parking lots across the Fermilab site during and after each weather event. In an effort to streamline parking lot plowing operations without jeopardizing safety, FESS Roads and Grounds, in cooperation with building managers, designate areas in about 25 parking lots that will not receive snow removal service. These areas are marked with lime-green safety cones. 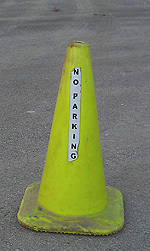 The cones will designate the areas as no-parking zones throughout the winter season. No vehicles may park in the marked zones. The cones will remain in place until the second half of March. Fermilab security personnel will monitor the no-parking areas. Establishing these areas allows for effective and frequent snow removal efforts in high-priority locations while keeping costs low. In addition, using less salt and less fuel will have a beneficial environmental effect. It's important to focus our efforts in keeping the roads and walkways as clear as possible, as injuries resulting from falls while walking on snowy and icy surfaces continue to be one of our main winter concerns at Fermilab. With more than 400 building entrances on site, it is challenging for snow crews to keep every entrance snow and ice free all winter. Employees and users are encouraged to walk more slowly, to take smaller steps and to look closely for snow and ice. Uneven surfaces can complicate matters. Chunks of ice and snow or even coarse rock salt can cause normally smooth surfaces to become uneven. Expect the unexpected, wear footwear that provides traction on snow and ice, slow down and don't let yourself become distracted while walking in winter conditions. If you have questions about parking during the winter season, please contact the building manager for your work area. Tyler Alion, ND; Anindya Chakravarty, AD; Michael Delaney, ND; Roza Doubnik, ND; Tyler Drendel, AD; Joshua Einstein, AD; Beth Fancsali, DO; Angela Fava, ND; Anastasia Kocher, WDRS; Irshad Mohammed, PPD; Melissa Ormond, DO; Joy Pomillo, DO; Tejas Rane, AD; Lisa Rush, TD; Kanika Sachdev, ND; Basil Schneider, PPD; Frederick Schwartz, ND; Dheeraj Sharma, AD; Navneet Kumar Sharma, TD; Ryan Thiede, TD; Arvydas Vasonis, FESS. Gianluca Petrillo, SCD, started at Fermilab in October. 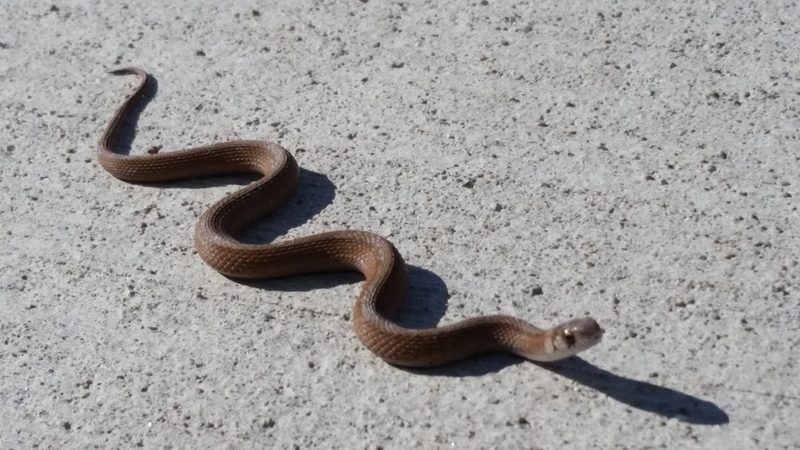 Fermilab welcomes them to the laboratory.